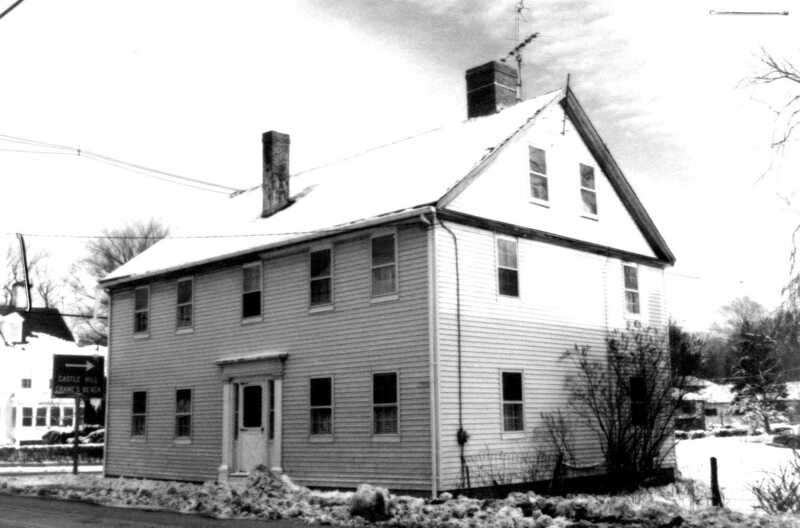 The David Giddings house at 72 County Road is right on the corner with Argilla Rd. Built in 1828, it has been used in the past as a general store and currently as a single family home. It has four fireplaces, authentic moulding, pumpkin pine floors, and Norwich door handles. View MACRIS. The site of the David Giddings house was bequeathed by Jonathan Wade to his grandson Nathaniel, who came into possession of the property in 1749 (Essex Probate 329:133).The site may have originally been used for a shop instead of (or as well as) a dwelling. Wade Cogswell inherited the property from his grandfather Nathaniel Cogswell, a Rowley doctor, in 1822, and in 1828 Wade sold the lot and the one story shop standing on it to David Giddings (Essex Probate 259:229). The 1832 Ipswich map shows the “David Giddings home and store.”Giddings enlarged it to a dwelling by adding a two-story portion facing the Green. 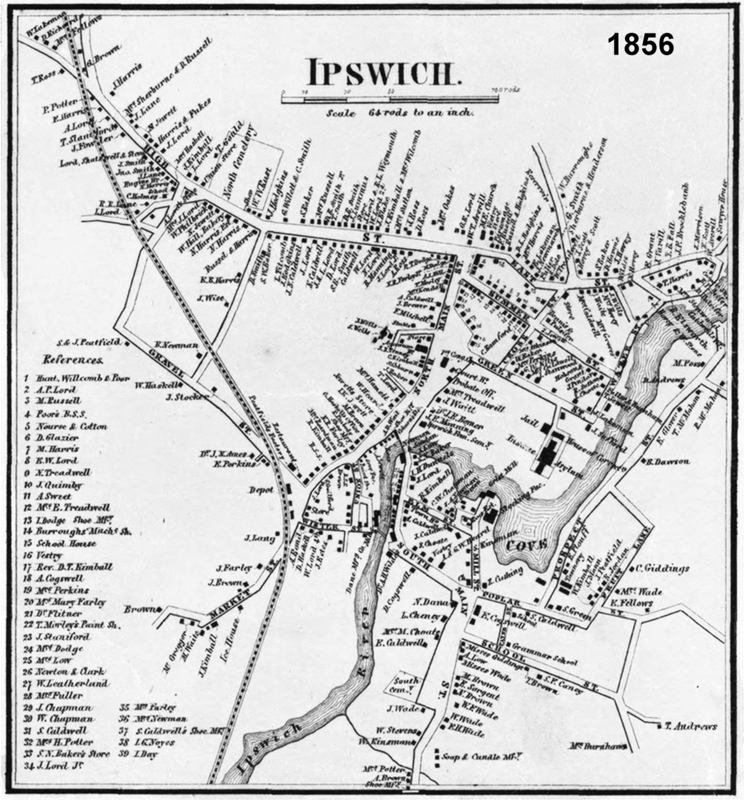 The 1856 Ipswich maps shows the owner as “Mistress Giddings.” In the twentieth century the shop portion, by then reduced to the role of an ell on the rear of the main house, was removed, and only the 19th century structure remains. The 1872 map shows the rear wing, which probably explains why the rear wall in that corner has two studded walls, with plaster facing the outside on the inner wall. David Giddings was born in Ipswich in 1771, the son of Joshua Giddings and Bethia Appleton. 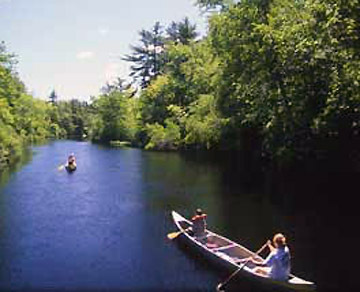 Giddings was a descendant of George Giddings and Jane Tuggle, who were among the early settlers to arrive in Ipswich in 1635. David Giddings married Bridget Whipple and they had 8 children. He worked as a tanner. David Giddings died in 1854. The book, Portrait and biographical record of Sheboygan County, Wisconsin has a section about a David Giddings from Ipswich who was the son of Joshua Giddings. In the story, David Giddings worked in a liquor store in Ipswich and after seeing its effects on his clients, quit and realized his dream to move west. In 1835 he took a stagecoach to Buffalo, boarded a brig to Chicago, then built a primitive boat with a friend and sailed it to Green Bay Wisconsin, arriving there with $5 in his pocket. He made his home in Sheboygan, obtained a job as a surveyor, was elected County Judge and to the state legislature. David Giddings built several sawmills, became wealthy and purchased a 500-acre farm in Fon du Lac, where he retired and lived to a ripe old age. The relationship to this David Giddings is uncertain.